I picked up this booklet at Jo-Ann’s because I’ve been wanting to learn how to do this technique. I’d previously purchased some crochet magazines from Russia but really hadn’t had much time to try to figure it out. One of the things I like about Bruges lace is the way the design can snake around a piece but since it is made in sections then joined together later, it can easily incorporate multiple colors or, of course, just one color. 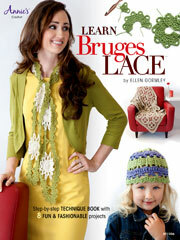 Learn Bruges Lace by Ellen Gormley teaches the basics of crocheting Bruges lace. The booklet gives a short history of Bruges lace, then goes into instructions for 10 stitch patterns, followed by 8 patterns, a metric conversion chart, and a stitch guide. Patterns include two scarves, a bracelet, three hats, a cowl, and a throw. The instructions include detailed photos, text, and symbol charts. The designs are beautifully photographed and most of the patterns are easy enough for anyone to follow. There are at least two patterns that are a little more complicated, the cowl and blanket, and should give more experienced crocheters something to sink their hooks into. This booklet is an excellent starting point for learning Bruges lace. If you are interested in going further with this technique, check out Pinterest by doing a search on “Bruges lace.” A couple of years ago, there wasn’t much you could find on the internet but there has been more available recently and it shouldn’t be hard to find more complicated designs that you can build on after finishing this booklet.